National Advocacy Organization Awards $100,000 in Grants to Support Growing Diaper Bank Movement in U.S. There were 268 press releases posted in the last 24 hours and 153,584 in the last 365 days. National Diaper Bank Network and its 280-plus member diaper banks lead a growing national movement to keep all babies clean, dry, and healthy. Community-based diaper banks rely on donations of diapers and dollars to help keep babies clean, dry, and healthy. National Diaper Bank Network's Funds for Change support local diaper banks, and ultimately families struggling to meet a most basic need of infants and toddlers, access to clean diapers. NEW HAVEN, CONNECTICUT, UNITED STATES, January 14, 2016 /EINPresswire.com/ -- For the second consecutive year, the National Diaper Bank Network (NDBN) has announced the awarding of $100,000 in competitive grants to community-based diaper bank programs in the U.S.
Twenty-nine organizations operating in 21 states have been named recipients of NDBN’s 2016 Funds for Change grants, the only initiative of its kind dedicated to supporting the diaper bank community. The $100,000 awards include four $10,000 grants and 25 grants of up to $2,500 each. NDBN’s Funds for Change advances the work and expansion of local organizations serving families and children experiencing diaper need. Defined as the lack of a sufficient supply of diapers to keep an infant or toddler clean, dry and healthy, diaper need impacts one in three U.S. families, and is often a hidden consequence of poverty. Nearly 5.3 million babies in the U.S., aged three or younger, live in poor or low-income families. To date, the net impact of NDBN’s Funds for Change initiative exceeds $400,000. Each grant recipient in 2015 and 2016 was required to demonstrate fervent local backing via a dollar-for-dollar match prior to receiving the awards. In 2015, 61 NDBN-member diaper bank programs received grants of up to $2,000 each. •	Program Demonstration Awards of $10,000. The micro-funding grants were awarded to 25 diaper bank organizations to fund proposed programs or projects that support a plan for long-term growth and sustainability. 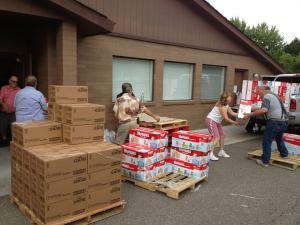 The strategic investment grants of $10,000 were awarded to two organizations—the Idaho Diaper Bank in Boise, and Treasure Coast Food Bank in Fort Pierce, Fla.—to create mobile diaper distribution programs targeting families living in rural areas in their respective communities. Greater Kansas City’s HappyBottoms and the Philadelphia-area Mitzvah Circle Foundation received $10,000 program demonstration grants for existing programs capable of being expanded and replicated by NDBN-member diaper banks throughout the country. HappyBottoms’ “Bundle of Joy” program works with local hospitals to reduce immediate diaper need of families with newborns. Using open-source cloud management software, Mitzvah Circle Foundation has developed an internet-based system for identifying and assessing online referrals, and tools for tracking donations and the delivery of material support to struggling families. The 2016 recipients, including 13 first-time awardees, represent both newly formed and established diaper banks serving families in all sizes of communities throughout the country, from rural areas to major cities. Funding for the initiative was made possible by a combination of support from individual and corporate donors as well as major gifts. Continued financial support will enable NDBN to continue the program next year. Since its founding in 2011, NDBN has championed the diaper drive movement, and built a network of more than 280 community-based diaper bank programs working 45 states, D.C., and Guam. The following provides a complete list of 2016 Funds for Change grant recipients listed by state and city. California: Santa Monica, Baby Buggy, Inc. (LA) • Connecticut: Bozrah, DUB4U • District of Columbia: DC DiaperBank • Florida: Fort Pierce, Treasure Coast Food Bank; Panama City, Junior League of Panama City Diaper Bank • Georgia: Snellville, Helping Mamas, Inc • Idaho: Meridian, Idaho Diaper Bank • Illinois: Champaign, Bottom Line Diaper Bank; Evanston, Bundled Blessings Diaper Pantry • Kansas: Kansas City, HappyBottoms • Maryland: Reisterstown, ShareBaby, Inc. • Michigan: Lansing, Mid-Michigan Diaper Bank: Midland, The Diaper Alliance • Minnesota: Spring Lake Park, The Diaper Drive • Missouri: Fenton, H.E.R.O.E.S. Care, Inc.; Springfield, Diaper Bank of the Ozarks • New Jersey: New Brunswick, B-FED (Anshe Emeth CDC); Union, Moms Helping Moms Foundation • Ohio: Gahanna, Columbus Diaper Coalition • Oklahoma: Tulsa, Emergency Infant Services • Oregon: Portland, PDX Diaper Bank • Pennsylvania: Blue Bell, Mitzvah Circle Foundation; West Conshohocken, Cradles to Crayons PA • Tennessee: Nashville, Nashville Diaper Connection • Texas: Austin, Austin Diaper Bank; Galveston, Galveston Sustainable Communities Alliance • Virginia: Virginia Beach, Greater Hampton Roads Diaper Bank • Washington: Issaquah, Eastside Baby Corner • Wyoming: Rock Springs, United Way of SW Wyoming Community Diaper Bank. The National Diaper Bank Network (NDBN) is a nationwide nonprofit dedicated to ensuring that every child in the U.S. has enough diapers to be clean, dry & healthy. Founded in 2011, the network raises awareness of diaper need (#DiaperNeed) and supports the development and expansion of diaper banks in communities throughout the country. Its active membership includes more than 280 diaper banks, diaper closets and food banks located in 45 states, Guam and the District of Columbia. Huggies® supports NDNB as the founding sponsor, and works to combat diaper need through the Every Little Bottom campaign by donating more than 20 million diapers per year to families in need. More information on NDBN and diaper need is available at www.nationaldiaperbanknetwork.org, and on Facebook (www.facebook.com/NationalDiaperBankNetwork) and Twitter (www.twitter.com/DiaperNetwork).